On Monday, February 27th-2012, the Petaluma City Council will be voting to certify the Environmental Report for another large shopping center in our community. Located along N. McDowell at Rainier Avenue, It’s called “Deer Creek Village”, and it consists of a 343,998 sq. 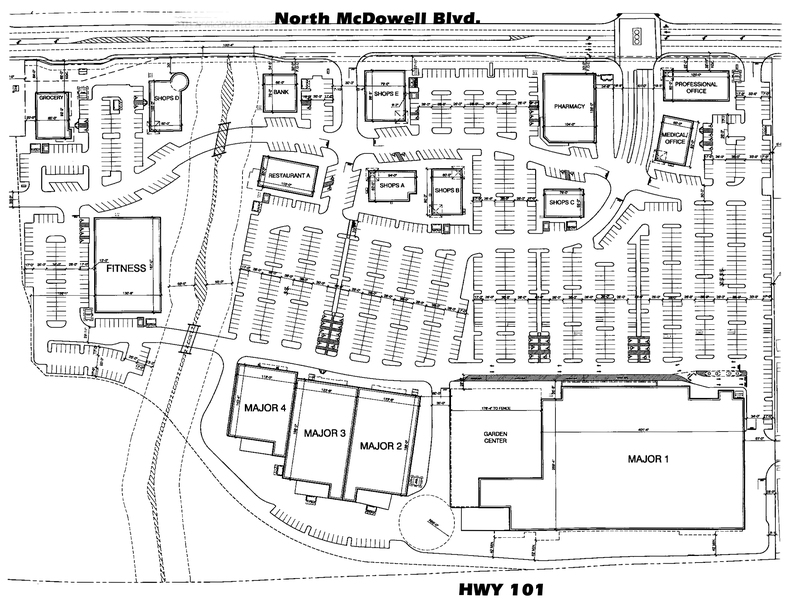 ft. sprawling commercial retail project, that includes a 44,450 sq. ft. fitness center. The certification of the project’s CEQA document is the most important phase of the approval process -yet, the majority of the City Council members are poised to approve this CEQA document that fails to address the project’s impacts on our community. How can the City Council approve this impact analysis, when they know it does not meet the legal obligations of CEQA Laws? They simply do not have sufficient information to allow it to move forward. Approval of this shopping center will be one of the most important planning decisions that our city will make – do not let our elected officials side step their legal obligation to our community! 1) The project will have an enormous impact on traffic conditions, adding up to 10,000 more automobiles daily on McDowell and the surrounding streets. The CEQA required analysis grossly neglects the traffic impacts and provides no real means of mitigating these problems. Instead the City consultants have tethered all traffic mitigation to the City’s General Plan. This is a major problem because, the GP traffic mitigation for the cumulative impacts of both projects (including the Target project) relies solely upon infrastructure (e.g. Rainier Crosstown connector) which, since the elimination of RDA funding, the City does not have the means, or funding resources to build. Our city’s main thoroughfares and intersections already have major problems, it is irresponsible to allow these roadways to degrade any further by adding more cars by way of more auto-centric development approvals. 2) The project EIR does not contain a complete water usage assessment. Again they tier water usage and mitigation off the GP’s EIR which cites conservation measures through the use of “recycle water” to off-set future development needs. The problem with this theory is, there is no plan and no funding to build infrastructure to accomplish this goal. At present, it is not been stated how much water the project will use. Based upon the known water use, of 13 million gallons per year for the Target project, we can estimate Deer Creek Village, with its proposed Fitness Center, to use even more than the Kenilworth project. 3) With this weeks announcement that Friedman’s would possibly locate at this site, the City still has not addressed the true economic conditions of blight once both projects are up and running. The economic impact analysis is still an essential componant of the CEQA process. For this very reason, to prevent blight! Yet, the City Council has ignored the findings of the analysis that explicitly states the loss of millions of dollars in sales from existing retailers to absorb the additonal 700,000 sq.ft. of new retail in our community. The Financial & Economic Impact Anaylsis clearly points out the high likelihood of Plaza North’s Kmart and CVS closing. This is exactly what the CEQA Laws were intended to prevent, unnecessary blighted conditions -but, the City Council has ignored this essential element of sustainable growth under the laws. There are many more problems that need to be raised and addressed in the coming months regarding the cummulative impacts of two very large shopping centers in our community. Please join us in opposition to this project and request that the Council not allow the FEIR to move forward without a comprehensive analysis of the effects on our community, and suffcient means to mitigate the project’s impacts. DEIR: Draft Environmental Impact Report for the Deer Creek Village is available on-line for reading. You have until the 25th of April to respond to comments for the PUBLIC RECORD. See the City of Petaluma Website for a copy of the DEIR. Attending this city council meeting is important! Traffic: Their shopping center proposal is estimated to generate 10,000 car trips daily in and out of the project area. Impacts from Old Redwood Highway to McDowell Blvd, Rainier Avenue up to Maria Drive are at levels E and F. Levels are rated from A-F. Level E and F are unacceptable. Gridlock is unhealthy for all Petalumans. Protecting Our Hospital: Getting to the hospital in an emergency is vital. Depending on sirens is not the answer when you’re the one in the ambulance. Our fire department has always said a Rainier cross-town connector is vital for our community to get to our hospital safely. NOW the same people are saying sirens are enough to get across town to our hospital. Transportation: The Rainer cross-town connector/interchange is not funded and yet it’s the mitigation for both the Deer Creek Village and East Washington Place projects. The new update cost for a full interchange and cross-town connector is over $160 million. Who pays? Our city is broke. Pollution: The amount of air pollution from this project is over 13.2 % higher than acceptable standards. This is NOT acceptable, and can easily be lowered by designing a walkable project that will reduce the amount of traffic. Noise: The City of Petaluma is moving quickly to approve “Deer Creek Village.” For those who have backyard’s backing McDowell Blvd, I urge you to write to the City of Petaluma and ask that the developer do a better job minimizing the impacts to our neighborhood. Sound Wall: The fence on North McDowell from Profession Drive, to the Sandalwood Mobile Home Park is falling down. This is eyesore and it lowers the value of Park Place Neighborhood. A sound wall needs to be required by the city before this project can be built. Zoning: The project site is zoned for “Mixed-Use” development. Petaluma’s General Plan requires that Mixed Use be “pedestrian oriented”. The General Plan also recognizes the need to reduce traffic impacts and pollution along McDowell Blvd. What can you do? Contact our Mayor and Council Members and voice your opinion. This project is not about shopping, it’s about our quality of life in Petaluma. We knew this land would be developed but, the size of the proposed project and its impacts are more than our local roads can handle. East and West Side Residents: tell our City Council; Petalumans are tired of all the gridlock and pollution that comes with poor planning. Ask your city representatives to make the project comply with our General Plan and require that the developer build a well-designed walkable mixed-use project. NOT another big-box strip mall. Re: Appeal of Planning Commission approval on April 13th, 2010 of Site Plan and Architectural review of the East Washington Place Development, including architecture, landscaping, layout, and site amenities. Regency Petaluma, LLC, applicant/property owner. This letter is to outline the basic pertinent facts and grounds for our appeal, as well as the relief we seek in regards to the above referenced Planning Commission action. On April 13th, The Planning Commission substantially approved the above referenced project design, with minor modifications. Because the approved design with changes clearly contradicts the Petaluma General Plan’s direction and specifications for this site, we are compelled to appeal the Commission’s decision. Lack of buildings being situated along Kenilworth Dr. These are a few of the reasons we are appealing this decision. We regret that the Commission was too timid and easily cowed to assert its clearly stated preferences for some meaningful changes, forcing us to take this action. Reconfigure Johnson Dr. to move away from swim center/skate park: extend further south to T into an extension of Fairgrounds Dr., which can connect to Kenilworth Dr.
Place multistory mixed use buildings with active uses on ground floor with housing or office space on upper floors along Kenilworth Dr. These are some of the changes we feel are minimally necessary to make this project even close to acceptable for Petaluma. We hope that regardless of Regency’s meritless and bullying lawsuit, you will be able to rectify some of the most egregious shortcomings now embedded in the plan. In 2004, a City Ordinance was passed that established the terms and conditions for an easement to improve the access to the East Washington Place project. This easement is located in the EWP project plans where Johnson Dr. is proposed (see proposal map above). In the PC’s current deliberations on this project, it is the purview of the Commission to review and recommend changes to the project’s internal circulation, its egress, and its ingress. Despite erroneous advice from the Assistant City Attorney, the PC is completely within its rights and responsibilities to look at the configuration of Johnson Dr. As currently planned, Johnson Dr. has a stranglehold on our existing Swim Center and Skateboard Park. These facilities, which encourage healthy vigorous physical activity by the community’s children and adults, will be surrounded by multiple lanes of traffic on all four sides. This traffic will frequently be moving at a very slow speed, and in fact will often be gridlocked. The exposure to carcinogenic exhaust and particulate matter by adults and children (who are especially sensitive to the harms caused by toxic pollutants) is clearly detrimental to the community. We feel that this dangerous situation must be rectified by the PC. We wish to bring to your attention that the easement is not now in place, either contractually or by law. The enabling ordinance merely established an option for Regency Centers to exercise when it received all of its project entitlements and met all of its obligations as specified in the ordinance. In addition, the citation of the specific CEQA clauses used to justify creation of the option was inappropriately applied by staff. In fact, the sections cited, 15061(b)(3), 15303, 15304 and 15333 specifically state that they are NOT to be used to bypass CEQA review, which is exactly what has happened in this case. The language in these sections* states categorically that they are not to be used for major development projects that will clearly have negative environmental impacts, yet that is exactly the kind of clearly foreseen project the sections were applied to. This option was based on false pretenses for its justification and is therefore questionable as to its legal validity. Furthermore, it has not yet been exercised at this time. Therefore, should the PC direct that the road configuration be changed to better protect the public’s use of its public facilities, the easement can be readily renegotiated with the City. If for no other reason, because of the misapplication of the CEQA language, it should be redrafted. And that provides the perfect opportunity to rectify this tragic road design flaw as well. a safer, less hazardous means of ingress/egress with less impacts on our adjacent public use area. The road configuration that we have provided (see map below) has Johnson Dr. extending further south, intersecting into Fairgrounds Dr. This configuration will reduce the exposure to auto-generated pollution and improve access to the site from Payran St. as well. In addition, we recommend that the short extension of Kenilworth Drive from Johnson Dr. to East Washington St. that is being proposed as a means of vehicular ingress and egress become a bike/pedestrian access point only (see attached drawing). The above recommendations for a road reconfiguration does not make this large auto-centric commercial retail complex an ideal project for this site, but it at least provides some improvement on the current poor design. By pulling Johnson Dr. away from the pool center and by converting the Kenilworth Drive/East Washington Street extension to a pedestrian promenade, we can help to reduce the traffic impacts on the surrounding public amenities while at the same time making the proposal align better with Petaluma’s General Plan. 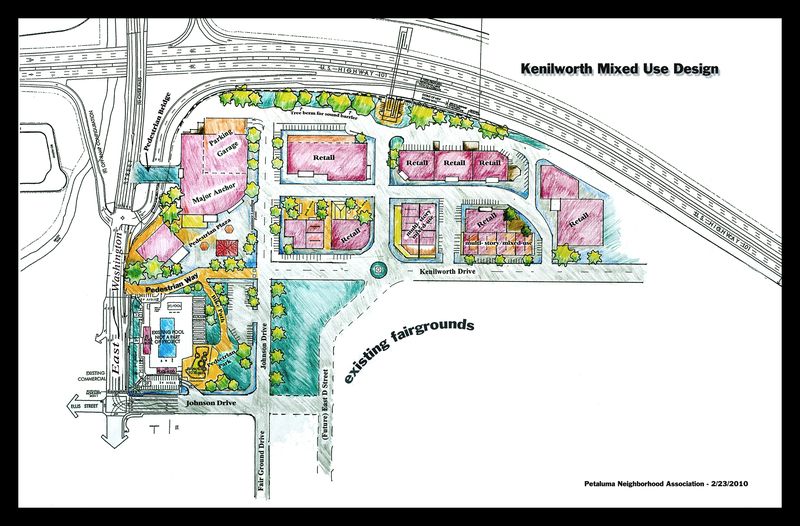 On February 23rd, at the Petaluma Planning Commission meeting, PNA members presented an alternative mixed-use design site plan drawing for the Kenilworth parcel. The design layout was heralded as a superior design to that which was proposed by Regency Centers. The community’s design concept better represents the vision of Petaluma’s General Plan which calls for “design standards that promote pedestrian orientation”. This redesign layout presented by the PNA gave the community a better option, and left many Petalumans wondering why Regency Centers is so adverse to building a well designed project here in Petaluma?